1-1. Refining Percentages Simplified The percentages have been consolidated depending on the ratings. These percentages indicate your chance of success each time you refine. 1-2. 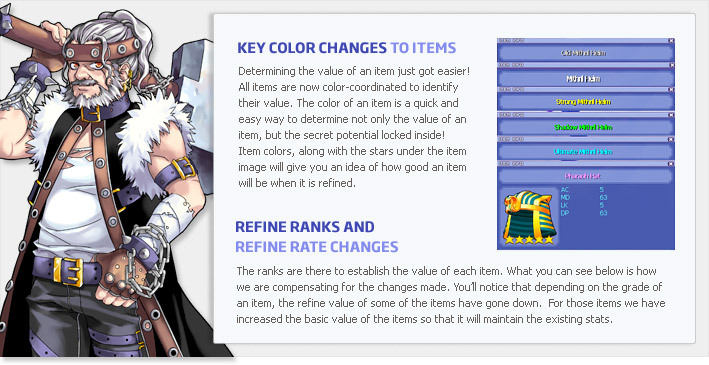 Standardized Refining Value According to Item Rank The probability to refine has been standardized for each item rank. These percentages indicate the amount of bonus stats you will receive each time you refine. 2-1. With the changes that have occurred with this update some items have been changed. To help compensate for the reduced stats for some items because of the changes, we have increased base stats. The stats for My Shop and Egg Shop equipment have increased, so there is no compensation for them. 3-1. The required refining stones have changed. Required refining items were changed in order to simplify and reduce redundancy with refining items in some locations. This will also help with refining being difficult in higher levels. * The levels for 171 - 190, 191 - 200 have been consolidated into one rank 171 - 200. * For levels 321 - 360 a new refining stone has been added. * Refining for equipment levels 360 and above will be updated at a later date. Last, but not least, the refining cost for all the items in Egg Shop are set depending on the value of the item. Whew! That was a lot of information! Hopefully, this will help you better understand the changes that have gone in. We hope you all enjoy the new refining system!